Negative mitzvah 187 tells us not to mix meat and milk. What's the message in this mitzvah? Meat is from the shoresh בשר. Milk is from the shoresh חלב. Each root (shoresh) which comprises its respective specific word has a kametz (a vowel) under the first two letters of the shoresh. These two letters of each word are two she'arim (gates)1. Consequently, we can see that meat and milk hold two gates which are not meant to be mixed. Kabbalah tells us that milk symbolizes life, while meat symbolizes death. The vowel kametz pertains to the sefirah Keter.2 Instead of mixing life and death, the two gates of milk and meat are meant to be transformed, leaving a singular gate into Keter, made of eternal life. The gate of eternal life is comprised of the remaining single letters of each word. That gate is רב (rav, see Shem Chai). The gate of the Hebrew word for meat is comprised of בש, letters meaning "with sin" (with a dot over the left vav of ש) . In other words, it is important that the operation be carried out "with sin", as opposed to "with shin" (with a dot over the right vav of ש). This represents the extreme feminine pillar of Gevurah (the entire feminine array of the Gevurot), within the realm which may give birth to evil. The operation is one completely performed in the Gevurot - herein lies the key to the mystery of parah adumah ritual. It is an utterly female science, devoid of masculine Chesed. It is the Chesed a woman must find within Gevurah, unmixed with Chesed of Chesed. In other words, to elevate Gevurah to Binah, to transform judgment into understanding, and to move her center of consciousness from the middot to the mochin, a woman must do this operation alone. The gate of the Hebrew word for milk is comprised of the letters חל, letters shared by the foul-smelling incense spice chelbenah (galbanum). Chelbenah represents the pure source and root of evil within the "wholeness" of the ketoret. In this state, חל of Gevurah (of the 7 lower sefirot) is joined to Binah through the ב of the shoresh and pure "beholding" sight (נה-הן) of the soul, thereby "raising it" back into the realm of holiness as it exists centered in the sefirah Binah (of the 3 upper sefirot). This operation transpires in Gevurah-Binah and within the Gevurot. The kametz of the she'arim of milk and meat inform us that the Divine Will within the sefirah Keter performs it. Taking all this together, we can see that the prohibition regarding not mixing meat and milk pertains to rectifying, transforming and raising the source of evil back into the realm of the holy. The feminine operation is carried out in Binah, the entire array of the Gevurot, and directed by the Divine Will in Keter. Importantly, the mitzvah also pertains to nevuah. The prophetic messages of a Divine Messenger are not kosher until the transformative operation of the feminine force has been completed. In other words, the "mixing" of meat and milk cannot be done normatively (in Gevurah of the 7 lower sefirot). Rachel (ר-חל) is the catalyst which raises chel (חל also meaning "the best to enhance nourishment") of chelbenah (חלבנה) to Binah (בנה) where it is transformed into a feminine aleph (ל-אה) of expression. Meat and milk essentially transformed through the ketoret of Binah, may only be raised following transformation, into Keter. The kametz tells us this. Rav (רב) transforms to בר, meaning "with clarity". And now we can understand why prophetic messages can't be made mixed with meat and milk; i.e., they mustn't originate in Binah (בש) or the Gevurot. They must originate b'reish, בר, in Keter (where the Gevurot and Chasidim "exist" in Singular Unity) to effect a proper change in perception. Everyone hates me. My mother tells me not to harbor any illusions that it will ever work out. They wish I would die. I'm seizing. I'm rushed to the ER. They're putting an IV in my arm. I'm losing consciousness, but I know something's wrong. Defibrillator pads are put on me, as well as the EKG leads. What's on the monitor? I asked the ER nurse. Still not quite faded out, she hesitates, thinking I'll pass out before requiring an answer. What's on the monitor? I ask her again. Some PVCs, she says. How many? I ask. Alot, she says. I'm dying. I know it. My legs are being put into stirrups. My abdomen is being prepped for surgery. A C-section. A child is going to be delivered. I woke up. And cried a few tears before I let steel cover my heart. I feel like I'm being treated like the "clone" in the movie The Island. People think I'm less than human. They want me to die after giving birth. They think I'm growing a child FOR THEM to raise, just like the "good couple" in the movie who grew a clone to carry a child so the woman wouldn't mar her beauty. Then, once the child is born, they'll euthanize me. Just like the clone in the movie. I want to vomit. Arrogance. Such pathetic arrogance. Exactly one year after carrying out a “Pulsa Denura,” an ancient Kabbalistic death curse, against former Prime Minister Ariel Sharon, Right-wing extremists held a similar ritual targeting Prime Minister Ehud Olmert, Channel 10 reported Tuesday. There was a nearly unanimous agreement throughout the Heavens that this man was truly one of the thirty-six righteous men of his generation, and that Tovil was definitely one of the thirty-six righteous women of the world. Everyone agreed except one. I dreamt. Enemy operatives had penetrated our territory. A few of us in the danger zone were maneuvering to evade capture. Everyone looked like bald humanoid creatures from a 1950's Sci-Fi movie, Creature From The Black Lagoon. Our side was light silver-greyish colored. The creatures from the other side blended in with the night and were hard to see against the darkness. But, I could discern their presence in the night. The male creature I was with and I were climbing out near the mouth of a shaft of some sort which led up to ground level, into safety. At the base of the shaft, there was a dark watery horizontal tunnel off to the side of a landing that formed a standing platform of the shaft. The watery tunnel and shaft remind me of caverns and underground city tunnel systems. One of our male silver-grey creatures had been captured and was being dragged into the abyss of the dark watery tunnel by a group of the dark bald creatures. We couldn't save him. There were too many of them and only 2 of us. As he was being dragged off, he reached up toward us with a silver-greyish "information chip" in his hand. The chip was shaped like a domino. He told the creature I was with to take it. It contained vital intelligence information. He hesitated briefly to take it, not knowing if the information would be "tainted" or not since our friend was now in enemy hands. Take it! our captured friend pleaded, as he was being dragged off underground. It's clean. It contains information we'll need. His mind was trained, like a soldier. It wasn't tainted information. He didn't want his capture to be in vain. My friend reached down and grabbed the chip of information from our friend's hand just as he was pulled under into the dark watery tunnel. I woke up. A word clearly flashed through my waking consciousness. I don't know what it means and I don't have time right now to analyze it. But, this is the clue our captured friend has delivered to us. Fragmentation starts tomorrow? What can this possibly mean? Importantly, what can this mean where it is the good thing that I felt it to be when the words flashed through my awakening consciousness earlier. Chelek Elokah me'mal in action. Now insight flows through me like a flood into the world. An outpouring of shefa neshamot is on its way. This is a good thing. Destiny is coming to the world. It has been designated. I heard it decreed in heaven. As I woke up this morning, a clear phrase of words flashed through my consciousness. "Fragmentation starts tomorrow." Oddly, the words were soft and comforting. I have no clue what the phrase practically means, but it brought to mind "revealed good" for me. I hope it's true. I need something good to happen. Maybe others do too. A lie cannot endure without some kernel of truth supporting it.1 That kernel of truth is the shetiyah of all falsehood in malchut (and this world). Here, in this "place", truth may be separated out (recovered) from falsehood. This is a kabbalistic secret of separating challah, the mitzvah of a woman. Traditionally, the mitzvah of challah is understood to be the rectification (tikun) of the world of chaos (tohu). The wild country located "between" (binah) the main road and home in the previous dream represents the chaotic attribute of "wildness" (פראות). With a gematria of 687, פראות reduces to 21 (6 + 8 + 7). The 21st letter of the aleph-beit is the letter shin (ש). Consequently, the wildness (force of chaos) of the "wild country in between" represents the path of shin. The core letter and the core of eternal kedushah (holiness) around which פראות is established and transformed is the letter א, aleph. With the physical and divine souls in unity with each other and with Hashem, through the allusion of aleph, the core kedushah of פראות is kidshah le'atid lavo, everlasting. 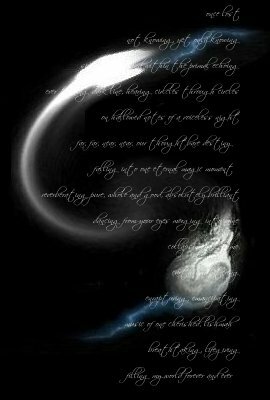 Aleph is therefore key to transforming the power of chaos, transcending the shin of this world, uniting it with the shin of the future world, and bringing into reality Divine Shefa of everlasting kedushah. Importantly, aleph implies equal measures of the yetzer hatov and the yetzer hara. A yetzer temimut. Right now, at this moment, I am contemplating the last decade of my life and how those years have been shattered. My 3 children are all young adults now. Good thing, as I have been homeless now for several years. My children were not adults when I began my return to Torah. Not only was my life shattered by the move (which even a hard life of suffering and violence had failed to do), but their lives were shattered as well. In significant ways. And I really don't know how to deal with the powerfully negative emotions that have stacked up for years upon years over this. I can forget the harm done to me. But, I don't think I can ever forget the harm done to my children. It is beyond my capacity to forgive without justice. What is justice? I don't know. I've never experienced it. But, one thing I do know, is that the black pit inside me will not be healed without it. Two words, two dreams: unpronouncable, unexecutable. A group of men1 (dayanim) whom I couldn't see, but could hear, were discussing my writings. They were trying to find a way to rule them "treif". The deliberations were intense and they were having a hard time finding a "proof argument" to rule them treif. Yet, they sure as ---- weren't going to stop deliberating until they found some reason to rule them treif. The group of men finally decided on the word "byte"2 in the phrase "byte by byte". Yes! They all concurred with the one who had suggested it. This is the reason, they unanimously agreed, they will use to rule my writings treif! So, they ruled my writings treif on account of the word "byte" in the phrase "byte by byte". But, I could sense the contrived ruling was itself treif and all those who had deliberated to rule it thusly knew it too. The ruling ruled falsely. And not one had properly defended my writings.3 Not one. The intent was not interested to discern emet (truth). It's interest was to manufacture evidence supporting a ruling of treif (dying).4 It was an unjust ruling, of Moav. Second dream. Zechut eretz Yisrael (malchut-tiferet וה). I was heading toward town down the main road (derekh)5 that runs in front of the house. Yet, I was trying to get home. To get there I turned off the main road onto a side road (netiv derekh eretz) to turn toward the direction of home rather than heading into town. There was snow6 on the ground. There were some hybrid crocodile-wild dogs eating animals they had hunted on the sideroad I had taken that led toward home. They eyed me. I eyed them right back, showing no fear. They let me pass, as without fear of them, I was too much "trouble" for them to attack. It was dangerous country I was in. Strange wild and ferocious creatures populated it. I walked on. In the distance, at the edge of this wild countryside, I could see a gas station. Civilization! If I can only make it to the gas station, I thought, I'll be safe. For some reason, these demonic creatures were confined to the wild country and couldn't enter civilized places. I was almost there. Then suddenly, many green-colored humanoid creatures of large stature came out the woods nearby and started to attack me. The humanoid creatures looked like "the incredible hulk" creature (in the television series). Somehow, those from the civilization responded to the attack (whether with intent to defend me or as an unintended act of hashgachah pratis7, I don't know), shooting arrows into the mass of green humanoids. It distracted the creatures' attention away from me, who pulled out their bows and also shot arrows into the air. Amidst a mass of flying arrows, I kept my eye (focused sight) on the gas station. I safely arrived to the edge of civilization. Interestingly, yesterday there was a major natural gas leak by the country club down the road from the house where I am staying. We weren't really affected in any significant way (other than to hear the news of the event). 1 Twenty-three judges are required to establish a beit din to judge capital cases, as judging something "treif" sentences it to the category of "dying" (treif). 3 The 7th Noachide law: establishing a legal system; the Noachide Laws apply to Jews as well as to non-Jews. In other words, the Noachide Laws are the universal spiritual laws which apply to all humankind. The particularity of any religious or moral tradition is established on the base of this universal human foundation. No particular system can "stand" without this base of righteousness. Not even Judaism. Judaism is a religious system based on Torah. Torah is not Judaism, despite that the religious system of Judaism is fashioned to "guard and transmit Torah". Torah belongs to all humankind. 4 The beit din cannot pronounce a capital punishment if the ruling is unanimous. There are lilacs growing along the fence outside my window. I smelled the soft fragrance of the many myriads the moment I stepped outside. The sky is dark and cloudy. It's humid. Storms have passed through. Yet stillness curls quietly through the country air, following me step by step upon the way. Don't count on halachah ve-ein morin kein and silent rabbis to save you from the Hand of Hashem. I've had my blog seriously hacked several times just in the past few weeks. It isn't funny. Moreover, it's cowardly. I think I've read in the past about some covert group that was doing this to Israeli websites that weren't "up to their standards" or something. I don't remember the exact context, but clearly, some "warriors for Hashem" misguidingly think they are modern day Pinchases, when in reality, they are nothing more than common vandals and arrogant ego-ists trying to impose their own vision of Torah upon everyone else. Haloscan commenting and trackback have been re-added to this blog due to hacker attack. The layout will soon be back to normal as well. Apparently, some US Senators drink water directly from the bottle and a Rabbi from (surprise) Brooklyn is convinced this means the end is nigh. As you might expect, we agree with the Rabbi wholeheartedly. It is a sign of the deplorable moral decline of our nation that some senators no longer use paper dixie cups. Water stays cleaner in a resealable bottle than in a cup, as it can be recapped and closed against dust and dirt flying through the air. It's the same principle as why biologists turn bottle caps inside down to set them upon a sterile surface when working with reagents under a laminar flow hood - to keep germs from settling down on the inner surface. Today's Thought From The Chabad Website. From the teachings of the Lubavitcher Rebbe; rendered by Tzvi Freeman. It has to come from the core, but we are not masters over that place. We can barely master our wardrobe--our conscious thought, our words to others, what our hands and feet are doing. Never mind the hidden things within. But we can do this: We can wash our clothes and bathe our skin in pure waters. We can focus our thoughts, guide our words and clean up our act. Once scrubbed enough that light can pass through, we await the moment when the core awakens. This is what Moses told his people on their last day together:"The hidden things belong to G-d. But the obvious is for us and our children forever, to do what needs to be done." I dreamt. I picked my son up from high school. I drove home upon a country road lined with trees and dense foliage. My son was in the backseat. I was driving. A friend was in the passenger seat. On the way home, we were stopped by a train. The car I was driving was at the head of a long line of cars stopped by the train. The train went from merely changing direction on the tracks to making a very "steep" and clear U-turn on the tracks. I kept my eyes on the train ... something wasn't right about the way it was turning so steeply. The train started to "lurch out" by centrifugal force because it was going too fast making the U-turn. It was going to derail! I threw my car into reverse and started to back up fast to avoid the derailing train that was coming straight toward me. But, there were cars behind me, so I could only go so far backwards. I had to stop after backing up only a short way. And prayed that somehow the train wouldn't hit us. It didn't. The derailing train cars passed right overtop the car I was driving and had landed on the cars behind us. All the derailing train cars missed completely the car my son, my friend and I were in. I was so thankful for our safety, and that we had been completely spared. Then, I heard the news. The little girl-baby in the car that had been behind us had been killed. Her neck had been stretched and broken by the impact of one of the train cars. It had stretched her out from the backseat where she had been sitting, thrown her through the front window and smashed her neck upon the hood of her parents' car. It was awful. The parents were beside themselves with horror. I also heard the news - 26 people from the line of cars behind me which had trapped me next to the train had been killed. I woke up and remembered what someone had written about my slideshow - that it was 36 seconds long. I went to check it out. It is actually 42 seconds long. I didn't make it 42 seconds long on purpose. It just came out that way. And no, just for the record, I don't wear a red string on my wrist. My first attempt at making a slideshow. I've learned a new thing today. There are two "kinds" of Temple service. One is called avodah, עבודה (which I already knew). The other is called pulchan, פולחן. Avodah is from the shoresh1 עבד and implies work subject to another's will. Pulchan, on the other hand, from the shoresh1 פלח, implies separating and dividing. It doesn't take a rocket scientist to see the significance. Avodah is the service one renders where one's will is yet to be rectified and brought into full alignment with the Divine Will. Consequently, avodah is the service done by one whose consciousness is primarily centered upon rectifying the middot. Pulchan is the service one renders when one's will is fully aligned with the Divine Will. At this level, where consciousness is centered within the mochin (capable of insight, differentiation and rationality) and integrated into the Divine Will, one can truly be said to have free-will (bechirah chofshit). At this "point of Will" (mocha stima'ah), one can make true free-will choices between alternative realities. This is not true for someone centrally operating within the middot, both "below" Binah (rational understanding) and where one's will may be highly influenced by powerful emotive forces. Moreover, pulchan is service which distinguishes, separates and divides "all potential realities", bringing true free-will choices between those potential realities into certain reality. Avodah works with a reality that already exists. Pinchas writes "If there is no Levi the Cohenim can wash their hands themselves or a firstborn can wash them." I find this tidbit of information interesting, given my previous post linking a "line of kehunah" through the phenomenon of pidyon haben(ot). Can anyone in the blogosphere elaborate on the halachic logic which establishes this "line of kedushah" linking the kohanim, levi'im and the firstborn? Kedushah implies dedicated focus on the task at hand. In other words, it is an orientation of one's entire being on fulfilling the Divine Will. Neither strong emotion nor emotional apathy perturb the dedicated focus of real kedushah. For some unknown reason, I and another "unknown mystery woman" (resha d'ayin) were locked in a room by the greater community, yet somehow I also locked us in it. I was upset about it, yet not. I couldn't get out of the locked room, yet I was the one locking its door. It's a paradox. Then I saw dangerous otherworldly creatures on their way with the intent to harm people. 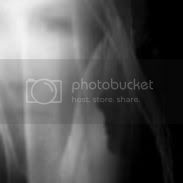 They tried to get me and the mystery woman locked in the room, but I completed (nukvah d'ze'ir anpin) locking the door just as one of the malicious creatures discovered that we were in the room and reached its skinny deathly-whitish arm toward the door. The other woman and I were now safely locked in the (ע) empty room. There was nothing in the room, but we two (Leah and Rachel). I somehow saw what the otherworldly creatures were doing outside of our safe room to the people outside without protection. The were tying humans down and "extracting" new otherworldly creatures from a place in the right groin area (where netzach interfaces with yesod) from each of them. The unprotected humans outside had been used as hosts to grow new dangerous otherworldly creatures. The extractions of new alien creatures were not safe surgical extractions. The extractions were violent; the new creature was torn out of the human like the human was just an animal. The ripping extractions remind me now that I am awake of the Noahide law not to tear the limb off a living animal -> the creatures were ripping "new otherworldly creatures" out of the humans' bodies like they were ripping limbs off living animals. I woke up after I saw what the otherworldly creatures were doing to the unprotected humans outside my locked room. are children of the "same category" - where that category specifically exempts sons from a positive mitzvah. Positive mitzvot are limbs (in the Israelite reckoning, while the limb mitzvah is a negative mitzvah in the Noahide reckoning; i.e., where the universal and particular covenants are unified)! Significantly, my firstborn son (Jeremy, ירמיהו) was born surgically by C-section due to a breech fetal position at birth. My firstborn by vaginal birth was my second child, my daughter (Amy, עמי). My second son (Michael, מיכאל), born following my daughter, doesn't require pidyon haben. Truth is stranger than fiction, so the saying goes. I have 3 children, just like there are 3 sub-categories within the category of exempt sons of Israelite women. Pidyon HaBen has no relevance at all to Kohanim and Levi'im, and "Our G-d is a Kohen" (Sanhedrin 39a); see Likkutei Shoshanim by R. Shamshan of Ostropolia, discussing when He is regarded as a Kohen Gadol, and when as an ordinary Kohen. But this does not contradict what I have written above (i.e., that Pidyon HaBen is in exchange for G-d's redeeming the firstborn of Israel); the fact that there is no Pidyon HaBen for a Kohen or Levi with five sela'im indicates the reverse, i.e., that five sela'im is not sufficient as an exchange for G-d's redeeming them in Egypt, for [in addition to redeeming them] their persons were also consecrated thereby. 1 The shoresh of sela'im is סלא which implies assigning some weighted value to something essentially priceless. The shoresh of kavim is קוה which is the same root from which the word mikveh is derived. קוה is also קו plus ה letters, לאתתא. In other words, קול אתתא represents and purifies like the pure waters of the mikveh. This level of healing (chayah) is analogous to the law that an impure (sick) body of water instantly becomes purified when brought to "kiss" the waters of a pure mikveh. In the same way, when the soul touches--"kisses"--the pure waters of the Torah, it "blends" into the living waters, thereby receiving sufficient life force to heal the body. Nevertheless, in the above saying of the sages--"if one's head aches..."--the term "aches" (in Hebrew, chash) is used (rather than a stronger word for physical illness), implying that the ailment referred to here is not one that has mortally impaired one of the vital, inner organs, but rather an "ache" alone of one of the body's limbs (or all of them--“if one's whole body aches..."). Continuing the analogy of the pure waters of the mikveh, the light of the Torah blinds the eyes of the impure "shells" (kelipot) responsible for the ailment. The negative influence of the "shells" disappears and the body recovers. However, when the vital, inner limbs of the body have been mortally impaired, the "kiss" of the light of the Torah is not sufficient to miraculously heal them. Taking all this together, the dream and its interpretation, we can see that those responsible to be tools for healing others must themselves be healed at a level greater than those they heal. Consequently, 5 sela'im are insufficient for the Israelite born of trauma, a levite or a kohen (i.e., those charged to "bless" Israel and the nations). Simply, my father's sister's husband (Abba Ila'ah, Tevunah and Yisrael Sabbah) is a hidden Jew (Arich Anpin). His hidden goodwill has somehow been a protective force (Ze'ir Anpin) for me to this point (Nukvah D'Ze'ir Anpin). I think he is a tzadik nistar whose time for hiddenness is no longer necessary, otherwise I would not have had the dream. I am overwhelmingly grateful and my heart overflows with compassion (chasdei David hane'emanim). This is the mystery of unification (yichud, יחוד). The individual who is worthy of the World To Come (לעתיד לבא) must unify the name of the Blessed Holy One. S/he must unify the upper and lower levels and limbs1, uniting them all and bringing them all to the necessary place where the knot can be bound. This is the mystery of "hear O Israel, Hashem is our G-d, Hashem is One". The mystery of "hear" (shema, שמע) is the "Name" (shem, שם) which becomes seventy (ayin, ע) names. This is the unifying category Israel. It is called the Elder Israel (Yisrael Sabbah), since there is also a lesser [Israel]. Regarding [the latter] it is written, "Israel is a child1 and I will love him" (Hosea 11:1). But [the one] alluded to in "shema Yisrael" is Yisrael Sabbah, the Elder Israel. [Yisrael Sabbah is] a single mystery and a single unifying category. "Hear O Israel" thus includes the [supernal archetype] female and her husband. In my mind, Daas Torah and free-thinking are not mutually exclusive. Moreover, they are complimentary and each necessary in the fruitful search for truth. Of course, I don't define Daas Torah as asking a Rabbi to make all one's decisions either. There is a time to ask and a time not to ask. May we all be blessed to be able to distinguish the times. I personally don't have a problem with the ideal of Daas Torah in terms of recognizing that there are people who understand more than I do. On the other hand, I don't believe that someone else's Daas Torah negates the validity of my own Daas Torah (even in a relatively underdeveloped state). If another person's "Daas Torah" becomes an obstacle to the development of my unique "Daas Torah", then I would question the advisor's motive and surely doubt that the advisor was answering from a position of "Daas Torah". Additionally, when someone suggests I abdicate my mind to an advisor's will - this is a clear red flag that Daas Torah is not the source of that advice. Human beings are given a mind to think with. Consequently, we are essentially commanded to use our minds to do just that. Achdut on my website with music and dancing hebrew letters made of empty spaces. I was going out to eat at a restaurant with my husband. I had a newspaper with a piece of clear tape on it. Underneath the clear thick packing or mailing tape was an invisible embryo which was being protected from being "lost in the wind" because of its small size invisible to the naked eye. I also brought a small plate of food with me for my son, I told the waitress. Don't mess with it. It's special food. I didn't tell her this (that it was special food or what it contained), but in the food on the plate that I had brought was an egg I was protecting. My husband and I were looking for a place to sit in the restaurant and somehow the plates of food associated with the table of my husband and I were moved by the waitresses. Some plates were on the floor by the table. Some were on the table. There were 4 or 5 plates of food. I became angry and started to berate the waitresses for putting my special plate of food (with the egg in it) on the floor - didn't they know it was holy! But, when I went over to pick up the plate of food off the floor, I saw it wasn't my plate with the egg in it, it was some other plate of food - not mine with the egg in it. So, I just left it there. My plate of food with the egg in it was on the table. I calmed down and backed off berating the waitresses. I woke up. In consequence to this dream immediately following reading this daf (in english and seeing it in hebrew), I am curious as to any insights anyone can offer regarding the daf. "and, hey, what woman would want to say no to wearing jewels?" On one hand, this final reflection points to a real root of the matter regarding gemstone segulot for pregnant women and their fetuses. Historically, it is quite conceivable and very likely that the superstitious idea that gemstones protect pregnant women (and their fetuses) developed as a feminine ploy to extort valuable jewels from husbands. We should pity the uneducated and poor man whose wife has such a passion for jewels that she would inculcate and enforce superstition to acquire them. On the other hand, perhaps these "protection" jewels provided (and still provide) a measure of financial safety to women who have historically needed (and still need) this "in a man's world". This is particularly true when a woman finds herself embedded within "a man's world" where women are primarily homemakers as opposed to wage earners. Given the historical mistreatment of women by abusive husbands, and the fact that even today, married women are more at risk for being murdered by their husbands than by a stranger, it is understandable how this superstition is allowed to persist. It's like insurance for many women. Tikkunei Soferim - No Passion For Truth? 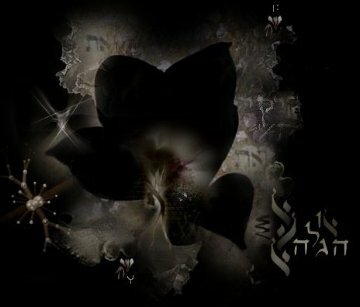 "The following interesting thing was brought to my attention by a friend, concerning a famous, controversial Rashi text. My thinking is that such scribal "emendations" are not rectifications. Rather, they are serious violations of the integrity of holy text. Perhaps Hashem humbled Himself to "stand before Avraham" precisely to give Avraham the power to work miracles of transformation (i.e., with the "humble" authority of Hashem) for Sodom and Gomorroh. The scribe who "emended" the text as described by the presented historical facts effectively sought to strip the children of Avraham of the G-d given power to act in Hashem's stead in the physical world. Importantly, Hashem gave over this power to act in the physical world in His stead to Avraham (and to the children of Avraham subsequently) through giving the Torah over to us as it is written, e.g., "standing before Avraham". A scribe has essentially rejected the responsibility by "emending" the text to demonstrate putative "respect" for Hashem. In actuality, the scribal emendation demonstrates quite the opposite - a lack of respect for Hashem and Hashem's Torah. The word shekel (שקל) is a code for the "complete" action of the soul during it's appointment with that Truly Divine. Apprehension, comprehension and the experience of shefa (and Divine communication) begin in the head (ש, see Sefer Yetzirah 3:6). It moves from the head into the gut (ק), from which shefa flows out (should one agree to "let" it). In consequence to letting shefa flow out, it doesn't get blocked, backed up into and remain in the head (ר, reish) - resulting in distortion and formation of the word שקר, falsehood. Distortion and falsehood result when shefa is not "let go". 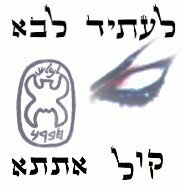 In contradistinction to that result, when shefa is let go, one turns inside out (ק goes to ל, rather than ק to ר) into Divine Truth instead of distorting into falsehood. The lamed (ל) action of the soul results in formation of the word שקל, shekel, as opposed to שקר, sheker. A half shekel one gives for the Temple refers to the shefa "half" that seems whole1 but really isn't ... there's a "rest of the story" to the dance with Divine Truth. it's an appointed service ... at "the appointment"
First, perhaps "blessing G-d" has to do with overcoming G-d's "inertia" in the physical world, where human beings are the agents of G-d's action. Consequently, it makes sense then, that giving our "blessing" to G-d gives G-d a "handle" to work in the world of action, so to speak. Second, many angelic names end with "iel" (יאל) or "el" (אל). It may be that the name Akatriel represents the pivot point of the epiphany. Akatriel likewise represents the monkey test, before one "turns inside out". Y-H follows turning "inside out". Both of these points support my previous hypothesis that when we "let go" of the initial infusion of G-dly knowledge, we are effectually "blessing G-d", thereby enabling G-d to work in the physical world through the door of our action. Akatriel Y-H is the gate through which we come to dance with the Divine. I was a poor lowly Jewish woman. My husband and I were simple Jews. Our situation reminds me of the movie Dreamer, based on the true comeback story of champion Mariah's Storm (alias in the movie, Soñador, meaning "dreamer" in Spanish). I had one horse (סוס) I had rescued and recovered1 (תרסו 666 -> 126 סוס). There was a big prestigious race coming up. My horse wasn't favored to win, and was the underdog. Nobody could even understand how my horse had been allowed to enter the race. One Jewish woman whose powerful purebred was also in the race outspokenly didn't believe I or my horse belonged in the race. She wanted us to be kicked out of the competition. She rallied behind the scenes to get my horse and I disqualified for various reasons. She wasn't successful at it. Though we were underdogs, my horse and I were led into the competition's sleeping quarters to rest the night before the race, to prepare for the race the next day. My humble horse was at the head of the line leading into the area where all the racing families and their horses were housed before the race. Though my horse was an underdog and not really expected to win, it's pre-race speed score qualified it for the prestigious "first" position. My horse is reishit. My nemesis hated me on account of it. She thought I didn't belong at the race at all, let alone being "allowed" to start in first position. Even though my horse and I had earned the "first starting position", she wanted it for herself and felt it belonged to her and her horse. She tried to rally people against me. She wore a tattoo on her arm like tefillin, although it wasn't tefillin. It was a tattoo. She tried to boast that she was more Jewish than I and that she deserved the first position instead of me. She flashed her bare arm with the tattoo around at people like it was a badge demonstrating her "real" Jewishness. She used this tattoo as some kind of symbol to demonstrate to everyone that she was more Jewish than I. Given that I didn't have this "symbol of Jewishness" tattooed on my arm like tefillin like she did - she implied that I wasn't Jewish and didn't belong in the race. She was trying to get people to doubt my Jewishness and that I even belonged in the race at all. She desperately wanted my horse and I disqualified. The tattoo (which she tried to pass off as tefillin) on her arm was her proof of her Jewishness (over mine), she preached to those she had gathered together. I stayed in my room with my horse and my husband. My horse was sleeping on the top bunk of a bunkbed in our room. The race doctor who checked all the horses for fitness prior to the race came to check out my horse. We woke the horse up and she stumbled down out of the top bunk. She was just like me - she stumbled awake with the kind of initial sleep inertia I typically wake up with. My horse and I were of the same stuff. I loved my humble beautiful sweet little horse. She was such a good horse. I smiled. The doctor put a thermometer in her mouth, checked her temperature and gave her a pre-race physical. She passed with flying colors! We are good to go! Meanwhile, as I observed my horse get her pre-race physical, in the back of my mind, I was aware of the rabble-rousing actions of my nemesis against me. I didn't know who she was exactly, but I saw what she was doing and why she was doing it. I saw her as she gathered people together to "preach" against me, all the while flashing her bare arm with its "Jewish" tattoo at them for emphasis. I also saw in my mind's eye, Nazis come into the racing community. They were among those she flashed with her bare arm and Jewish tattoo. They were going to cut her arm off. They grabbed her as one of them flashed a machete or some other similar large cutting blade. I warned her husband somehow that they were going to cut her arm off so that he could intervene to stop it. For some reason, I couldn't intervene in any other way but to warn him of the imminently impending amputation of his wife's arm. I was confined to my pre-race quarters - it was the fit thing to do. I had to stay with my horse and my husband. None of those the woman had gathered together to listen to her could intervene on her behalf either - anyone who intervened on her behalf would have his or her arm cut off along with the bare-armed tattoo-ed woman. Her husband was busy with a racing community meeting and brushed off my warning. He didn't believe me. He thought I was overreacting - the Nazis were just making trouble. He didn't believe they'd really cut his wife's arm off. He walked away from my warning, brushing it off. They were really going to do it. They captured her and tied her to a wooden wall of the community. They were preparing to cut her arm off. They are going to do it. I turned my attention back to my horse and husband, where it needed to be. My husband told me not to worry and held my hand. I knew my horse and I would win the race. Just like the horse in the movie Dreamer. 1 A horse (סוס) is symbolic of evolution (see link above). The gematria of its letters is 126, one less than the 100 and 20 and 7 years of Sarah. Importantly, 126 is the reverse im hakolel of 127, and thus is also the reverse vision, of Sarah's life, where 126 symbolizes the small self-nullification epitomized by Har Hermon and the tikun of Sarah's arrogance over Hagar. This makes sense, given that in the dream I am a poor lowly Jewish woman which reflects the soul powers of bitul and shiflut, respectively. Consequently, we can see that 666 has now not only been rectified with respect to the error of Adam and Chavah, but also with the respect to the error of Sarah and Avraham. This is accomplished by transforming 666 (תרסו) into a horse (סוס). Zohar refers to the Hebrew letters as horses of fire (shin, ש). My horse (hebrew letter) ran like the wind (aleph, ). Note that תרסו ends with 66, like the סו of the treatise Hemshech Yom Tov Shel Rosh Hashana Tof Reish Samech Vov. This word which ends with סו (where סו implies perpetuation) can be permutated according to meaning into the shoresh תרן, ending with a nun sofit (where ן also implies perpetuation). This shoresh means to "raise high" (Etymological Dictionary Of Biblical Hebrew, R. Matityahu Clark). Thus, 666 (תרסו) and the error associated with it is further transformed and elevated back into the realm of the holy through the permutation of 666 into 126, with an aroma pleasant to the Divine (like the ketoret), making shiflut become geut. Now, we can understand how Keturah is the tikun, re-unification and elevation of both Sarah and Hagar, who epitomize ruthlessness and selfishness in the feminine psyche, respectively. "First explanation: There are those who insist that in the first century, a Jew like Revelations author, would have referred to the Emperor as "Neron." Indeed, the Jastrow dictionary uses this spelling and the extra "N" at the ends adds 50, bringing our total to 666." "After the first sin , G-d said to Eve 'I will greatly increase your suffering ... in pain you will bear children' (הרבה ארבה עצבונך ... בעצב תלדי בנים , Bereshit 3:16). The expression for pain appears in 2 different forms in the same sentence. עצב refers to the short-lived pain of childbirth; while עצבון [in this verse with the possessive suffix - עצבןונך] refers to צער גדול בנים, the long term tribulations of child-rearing (Rashi). Thus, with the long final nun, עצבון indicates an ongoing process which continues over an extended period. [Likewise to Adam] the final nun of "through suffering you shall eat of it" (בעצבון תאכלנה, Bereshit 3:17) denotes constant toil and suffering (Pesachim 118a)." Clearly, from this connection between 666-Nero-nunsofit-GanEden, we can see that 666 is linked to the idea of "perpetuating the sentence" Adam and Chavah received in Gan Eden from prematurely eating of the tree of knowledge. "In Chassidic lingo this treatise is called “Hemshech Yom Tov Shel Rosh Hashana Tof Reish Samech Vov,” or more informally and intimately: plain “Samech Vov.” Samech vov is the number 66, short for the year 5666. Hemshech means a “continuation” or “sequence,” referring to the dissertation that began on Rosh Hashana 5666 and extended for 3 years, consisting of a total of 61 individual Maamorim (discourses), which were written and then publicly delivered by Rabbi Sholom Dovber Schneersohn (1860-1920), known by his acronym as the Rebbe RaSHaB, the fifth Chabad Rebbe, in direct line from Rabbi Schneur Zalman of Liadi." Consequently, we can see that "666" is indeed rooted in the Jewish tradition, even though it became adopted by and incorporated into the Christian tradition. "66" is likewise an embedded code in a Jewish kabbalistic treatise suggesting a remedy for cutting off "perpetuation" of the "666" error, thereby "fixing" the world, through addressing the questions "why are we here?" and "how do we make a dwelling for the Divine in the corporal world"?. Moreover, through understanding the Hebrew letters, 666 can be directly related to the debacle of Gan Eden. In Christian tradition, 666 is indirectly related to the Gan Eden debacle through the story of a "beast" (the beastly or animal soul) and its battle with the g-dly soul. Lavi writes that my explanation of "666" takes drush to unprecedented new levels, but then wonders if I don't worry that I'm doing exactly what I'm writing about -> partaking of mystical knowledge prior to its time. And my answer is no. I don't worry because I have already passed The Monkey Test. A few people have mentioned that yesterday was 666 (June 6, 2006) and have asked if these numbers have any significance in Judaism. Quite frankly, I don't know. Nevertheless, I can postulate what it could mean from a kabbalistic perspective, in such a way that we can understand how "666" came to mean "the mark of the beast" to Christians. We know that vav (6) and its multiples refer to tiferet-zer anpin. Shabbat consciousness is represented by 7 (tiferet + malchut or zer anpin + nukvah). The "error" of Adam and Chavah was partaking of knowledge prior to shabbat (attaining shabbat consciousness). So, from these few pieces of information we can see that 666 basically represents a perpetuation of the error which occurred in Gan Eden through the 3 lower worlds of beriyah, yetzirah and assiyah -> which is partaking of mystical knowledge prior to its time, thereby effectively dissociating zer anpin from nukvah. Consequently, we can understand that "666" would refer to a mystic who partakes of mystical knowledge prior to its time. Necessarily, such a person is a "beast" who has not brought his/her animal soul and g-dly soul into harmony, through attaining the level of "shabbat consciousness" prior to partaking of this knowledge.